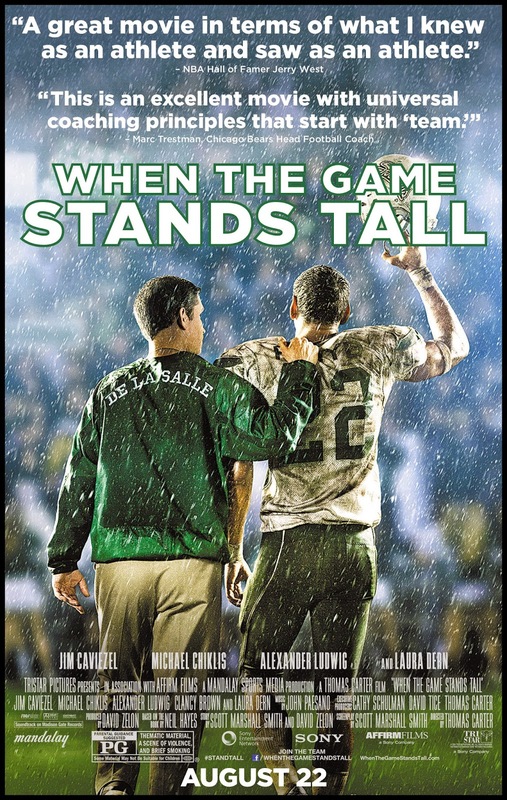 When the Game Stands Tall (2014) is a sports drama movie based on the actual events. The movie is about the record-setting 151-game between 1992–2003 high school football winning streak by De La Salle High School of Concord, California. The movie is based on the novel of the same name written by Neil Hayes and published by North Atlantic Books. De La Salle head coach Bob Ladouceur retired in January 2013 after winning his last Open Division state championship in December 2012 on which the movie is based. The sports movies are always based on getting a team together after the initial friction between various team members across various cultural differences and each one coming from a different social and financial background. This movie is also about dreams coming true for some of the athletes as they continue to strive against all odds to win 151 games in a row. The movie is directed by Thomas Carter also known for his Coach Carter (2005) movie. The movie has Jim Caviezel as Bob Ladouceur, Laura Dern as his wife, Michael Chiklis, Alexander Ludwig, Gavin Casalegno and Clancy Brown in main roles. It was great to see Alexander Ludwig in this movie after his Hunger Games movie series is a big hit. Jim Caviezel has played his role very well as a coach. The movie has it's ups and downs and it's always great to watch Sports action drama. Sony Pictures has really got something for all of us this time with this movie. I liked the movie but was expecting to see some more of the action like Coach Carter and other famous sports movies. The movie is nice for a good weekend watch on TV. Do catch it up sometime when it's played on the channels. Movie has released in Ster Kinekor on 14th Nov 2014. More info on twitter and facebook.